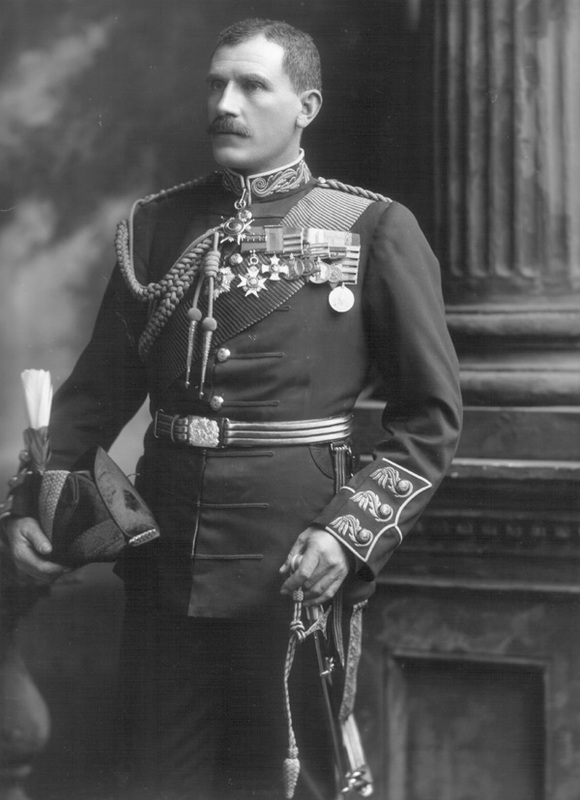 Biog: Enlisted 92nd (afterwards Gordon Highlanders), 1870; served nine years in the ranks; Colonel 1898; Brigadier-General 1899; Major-General 1900; A.D.C to Queen Victoria and King Edward VII. Location: The Lafayette Studio, 179, New Bond Street, London W.
Costume: Full Dress uniform, A.D.C to the Queen. Orders, Decorations & Medals: Badge of the Order of Osmania (3rd class) [Ottoman Empire]; badge of the Order of Medjidjie (3rd class) [Ottoman Empire]; Badge of a Companion of the Order of the Bath, (military division) [C.B. cr. 22 June 1897]; Distinguished Service Order [London Gazette, 25 February 1890]; Afghanistan War medal 1878-1880 with 3 clasps, 'Charasia', 'Kabul', 'Kandahar'; Kabul to Kandahar Star 1880; Egypt medal 1882-1889 with 2 clasps, 'Gemaizah 1888', 'Toski 1889'; Khedive's Star 1882-1891 with clasp [arabic script, trans. as] 'Tokar 1308 H' [Tokar 1891]; Khedive's Sudan medal 1896-1908 with 5 clasps, 'Firket', 'Hafir', 'Sudan 1897', 'Atbara', 'Khartoum'. Costume: Dress Regulations for the Army, London, 1900. Orders, Decorations & Medals: (Order of Osmaniah, Order of Medjidie) R. Werlich, Orders and Decorations of All Nations, Washington, 1990; (Order of the Bath) Burke's Peerage; (D.S.O.) Sir O'Moore Creagh, and E.M. Humphris, The Distinguished Service Order 1886-1923, (facsimile edition), London, 1978; (Others) E.C. Joslin, A.R. Litherland, B.T. Simpkin, British Battles and Medals, London, 1988.